"Thanks again for the archery lessons! You are the best. We tried archery tag several times but didn't really learn how to shoot properly until we met you. To anyone reading this, Charles is an amazing archery instructor who is very patient, very good at communicating ideas, and he helped us to get rid of a lot of our bad habits. You could not ask for a better instructor. He makes the lessons fun and we learned so much every lesson. "Charles provides quality archery instruction and service. 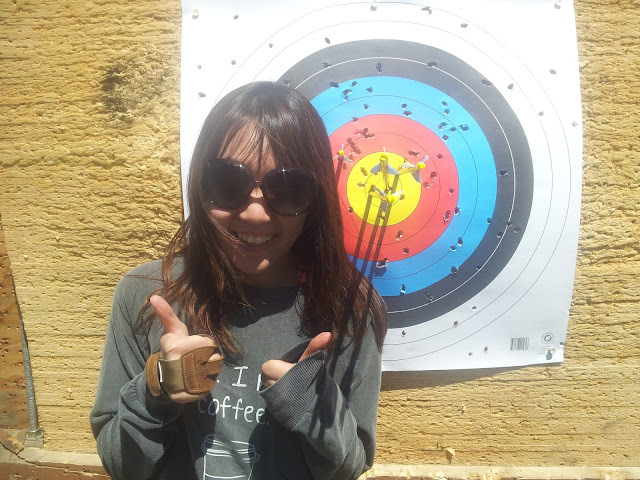 He has good attention to detail, is nice, friendly, very knowledgeable, and I am very happy with my archery skills. They are all due to his tips which covered everything from how to stand, how to pull, WHEN to pull, how to stand up straight, how to aim, how to release and much more. I had a problem with my drawing arm that was causing me to tremble, but Charles taught me how to fix it by pulling the bow correctly after pre-aiming. I would not have thought of that. He also taught me how to use consistent power so each arrow has the same amount of power and why that is important for accuracy. I am coming back for more lessons next year. Thank you for the archery lessons! "Charles is a great instructor. I took five lessons with him and each lesson is different and tailored to fix whatever problems I am having. By lesson 5 I was shooting long distances and even scored a few bullseyes. The part I enjoyed most was the drills in which he would challenge me to try new things, like moving a target ball around so I have to learn how to adjust my aim, adjusting my aim for windy conditions and shooting at moving targets. I never thought I would be able to shoot at moving targets or long distances so accurately, but now I can. I surpassed my expectations and now have my own equipment. I am extremely happy with the lessons I received. Before signing up for archery lessons I did my research. I did this because I want to get into traditional bowhunting and I wanted someone who understood what I was looking for. One of the things that impressed me right away is that Charles practices archery in the winter. From what I can tell he is the only instructor in Toronto who does that. He also does bowfishing, which is not the same as bowhunting, but impressed me nevertheless. I was also impressed by the amazing amount of archery tips he had on his website, all for free - which got me thinking, if that is all the tips he gives away for free, then what is he teaching? So I decided it would be worthwhile to sign up for 1 lesson. I figured 1 lesson wouldn't hurt. Wow. I learned so much in the first lesson it still boggles my mind. He started with a safety lecture, then he did an eye test to see which is my dominate eye, then he showed me how to put together a 3-piece recurve bow (at the time I didn't even know what a recurve bow was and I kept calling it a longbow by accident). Then he did a lecture on how to aim and then a lecture on proper archery form, which covered everything from what I should be doing with my toes, my fingers and even my neck. Then we started shooting. Charles was very careful to adjust my form each time I was shooting so I could get better shots and foster what he calls good habits. Sometimes he allowed me to make mistakes so I could see what a difference bad habits makes. By the end of the lesson I was shooting clusters at a target 62 feet away. Needless to say I immediately asked to sign up for more lessons. The following lessons taught me how arrow spine worked and how that effects the quality of the shot, how arrowheads come in different sizes and shapes and what they are used for, how to wax a bow string, how to properly string a recurve bow, how to string a real longbow, and he gradually increased the strength of the bows I was shooting so that I was becoming stronger. He also taught me several different aiming methods, which I found fascinating. If you want to hunt then you should routinely practice at double the distance you intend to hunt at. So for example if you want to hunt at 90 feet or less, then your should regularly practice at 180 feet. This way you feel confident in your accuracy at a time when you more likely to be pumped full of adrenaline and might start second guessing your accuracy. That was an important tip to me. But it was just one of many I learned from his lessons. What you see on his website is just the 'tips' of the iceberg. Thanks again!